The 2018 Honda Accord in Phoenix gets a modern makeover that makes it the best Accord yet. On the outside, the five-passenger sedan gets revised styling across the front and back, adding to vehicle's class and sophisticated aura. The long list of enhancements continue inside with the addition of soft-touch materials and high-end appointments. 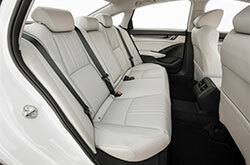 Mechanically, the Accord receives a new suspension and added sound insulation for an enhanced ride. On top of these perks, the sedan is equipped with a plethora of advanced safety gear like adaptive cruise control and lane departure warning as standard. For more details, continue reading our comprehensive 2018 Honda Accord review below. 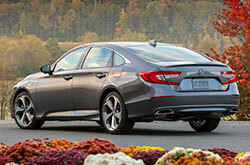 Like before, the Accord is offered in LX, Sport, EX, EX-L, EX-L Navi and Touring. 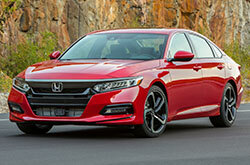 However, this model year, Honda has done away with the coupe, leaving the sedan as the only option. All models have been dressed to the max with various top-notch standards, including push-button start, dual-zone climate control, a 7-inch color driver information display a 7-inch touchscreen, a USB port and Bluetooth. Upper trims add even more premium appointments like leather upholstery, a power moonroof, navigation and a 10-speaker sound system, to name just a few. If you're looking for all the bells and whistles, there will be plenty of optional upgrades to choose from as well, from rain-sensing wipers, heated and ventilated front seats, and driver-seat memory settings to navigation, a head-up display wireless charging pad. To learn more about the Accord's available features, visit us today! A new 1.5-liter turbocharged four-cylinder engine, producing 192 horsepower and 192 pound-feet of torque, is standard on most new Accord models. It comes with a continuously variable transmission, however, the Sport can be paired with a new six-speed manual. Replacing its predecessor's V6 powerplant is a brand-new 2.0-liter turbo that generates 252 horsepower and 273 pound-feet of torque. It comes matched to a new 10-speed automatic and is optional Sport, EX-L, EX-L Navi and Touring models. A new and improved hybrid option is also offered. 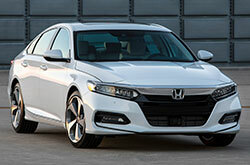 Aside from the new gear mentioned up top, every 2018 Honda Accord in Phoenix also comes equipped with several high-quality airbags, antilock brakes and a rearview camera. All trims fitted with the 2.0-liter engine also come with blind spot monitoring with rear cross-traffic alert for added safety. To learn even more about this savvy sedan, finish reading the rest of our 2018 Honda Accord review below. 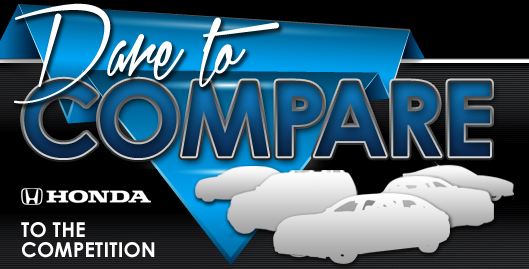 You can see photos, watch a walkaround video and compare the Accord to its top competitors, all without leaving our site! When looking for new cars in the Phoenix metro area, you may have seen the 2018 Kia Optima, Toyota Camry and the Hyundai Sonata, but the 2018 Honda Accord is also a meritable option. Its chic looks and clever cabin features may eclipse your expectations and meet your needs. After using our 2018 Honda Accord review and compare page, view current limited-time dealership offers online! To see a desirable selection of cars, come to us to find factory offers on the newest edition of the Honda Accord. When shopping for a car, it's crucial to make a responsible choice; that's why we've included this 2018 Honda Accord review the perfect fit on our site. Our reservoir of incredible Honda Accord models in Phoenix, AZ is large. Email to schedule a test drive and come see our lineup. Check out the included video recording to see its cabin equipment before you stop by! Purchase prices do not include tax, title, license and $395.00 doc fee. Prices include the listed Factory Offers and Incentives. Please verify all information. We are not responsible for typographical, technical, or misprint errors. Inventory is subject to prior sale. Contact us via phone or email for more details. *MPG Based on 2018 EPA mileage ratings. Use for comparison purposes only. Your mileage will vary depending on driving conditions, how you drive and maintain your vehicle, battery-pack age/condition, and other factors.